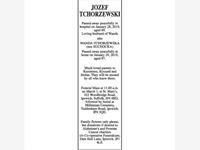 JOZEF TCHORZEWSKI Passed away peacefully in hospital on January 28, 2019, aged 89. Loving husband of Wanda also WANDA TCHORZEWSKA (nee SUCHOCKA) Passed away peacefully at home on January 29, 2019, aged 87. Much loved parents to Kazimierz, Ryszard and Stefan. They will be missed by all who knew them. Funeral Mass at 11.00 a.m. on March 1, at St. Mary's, 322 Woodbridge Road, Ipswich, Suffolk, IP4 4BD, followed by burial at Millenium Cemetery, Tuddenham Road, Ipswich, IP4 3QH. Family flowers only please, but donations if desired to Alzheimer's and Prostate Cancer charities c/o Co-operative Funeralcare, Dale Hall Lane, Ipswich, IP1 4LS.